The 2019 Zhuzihu Calla Lily Festival will kick-off on March 29. According to the Department of Economic Development (DOED), Taipei City Government, the main attraction at the Calla Lily Festival would be the merging of music concerts with landscape beauty. In addition to the decorations, the participating calla lily farms will take turn hosting concerts throughout the activity period, offering visitors a relaxing stay in the vicinity as they watch the sea of calla lilies under the afternoon sun. In addition to exploring the Zhuzihu area on your own, DOED is working with the staff of Beitou Farmers’ Association to offer guided tours on weekends and holidays during the festival period. On the days with tours, there will be one session in the morning and one session in the afternoon. Participants will travel to various scenic attractions at Zhuzihu and Yangmingshan, enjoying flower-picking, great food, and other activities during the tour. Yangmingshan area during the festival period. To ensure smooth traffic conditions, the city government will be implementing traffic control on major roads and avenues in the vicinity on weekends and holidays. For more information, please visit the event’s Chinese website (www.callalily.com.tw) or call Beitou Farmers’ Association at 02-2892-4185, ext. 540. MRT Beitou Station－Take route S9 or 129 (only travels to Zhuzihu area during Calla Lily Festival) to Zhuzihu. MRT Shipai Station－Take route S8 or 129 (only travels to Zhuzihu area during Calla Lily Festival) to Zhuzihu. 1.Take route 126 Flower Festival Express to Yangmingshan Second Parking Lot and transfer to route 128, 129, S8, S9 or 131 (128 and 129 only travel to Zhuzihu area during Calla Lily Festival) to Zhuzihu. 2.Take route 260 to Yangmingshan Terminal and walk to Yangmingshan Transfer Station to take route 128, 129, or 131 (128 and 129 only travel to Zhuzihu area during Calla Lily Festival) to Zhuzihu. MRT Jiantan Station－Take any of the following buses to Yangmingshan Second Parking Lot：109, 111, 126, and 127. 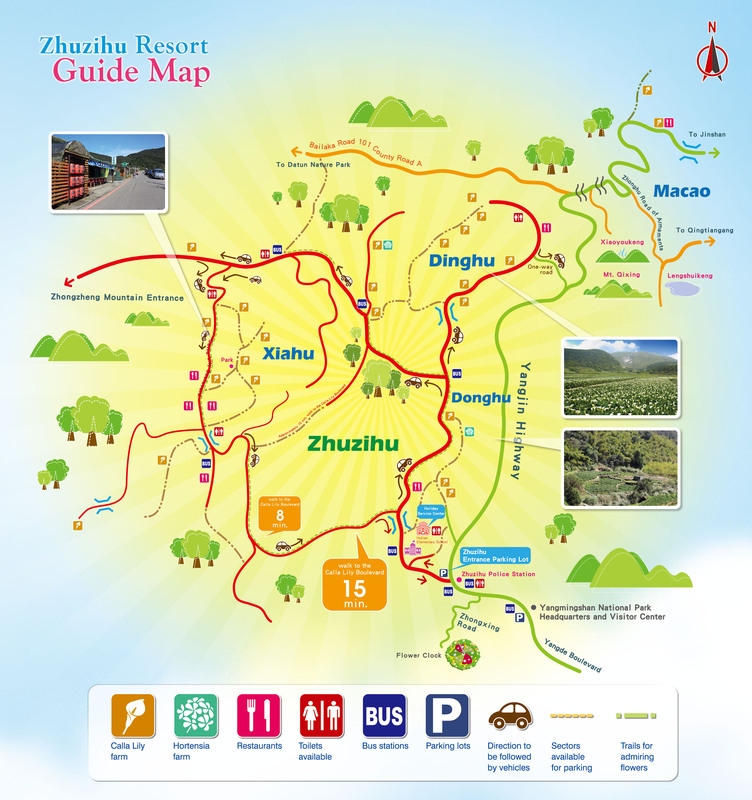 Transfer to route 128, 129, S8, S9 or 131 (128 and 129 only travel to Zhuzihu area during Calla Lily Festival) to Zhuzihu. Yangmingshan Flower Clock Area/Second Parking Lot: Take 128, 129, S8, S9, or 131 (128 and 129 only travel to Zhuzihu area during Calla Lily Festival) to Zhuzihu. Public Insurance Building on Gongyuan Rd. – Take “Taipei-Jinshan Line” to Zhuzihu.